I have received my fair share of ethical beauty boxes over the last few years, but I somehow had never managed to try out The Pip Box, a subscription service dedicated to cruelty free beauty. I have been following The Pip Box since their launch, and have noticed how quickly they have become one of the more talked about beauty boxes thanks to high customer feedback (4.7/5 as ranked by their subscribers!) and a positive presence across platforms. 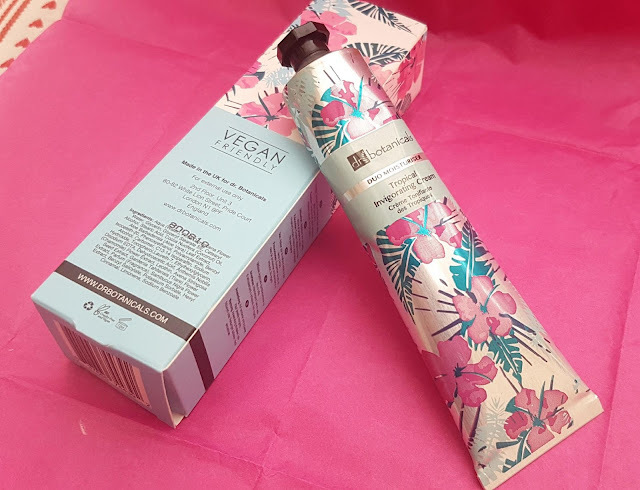 Well, this month I was lucky enough to be sent the March collection to review, and I can see why lovers of cruelty free beauty are excited about this service. The box always contains a minimum of five items, and they promise none of the products will ever be one-time-use sachets -- a huge bonus for anyone who is used to the tiny samples sent by the more mainstream Birchbox. The Pip Box also boasts an average value of over £45, which for a subscription that costs £18.34 (including shipping) is pretty great! The March collection is no exception, and has an RRP of £65! One thing I have to say before even getting into the products themselves is how much time has gone into the presentation of the box itself. When you open it up, the products are wrapped inside colourful paper tissue, and the information card is really well laid out and clear. Each item has a reason why it was chosen, and for this March box that reason was to do with the changing seasons -- the shades and formulas are all perfect for Spring. The March edition contains four full size products and one 'try me size,' and is a great mix of skincare and makeup. I really like the variety, as it means there is a little something for everyone here. Everything in the box is both cruelty free and vegan this time around, and two items are also natural. The featured product this month is from Dr Botanicals, a brand that also provided the main piece from the February collection. This "Tropical Invigorating Cream" is a duo-moisturizer that is sold for £44 online. With soothing and nourishing active ingredients like chamomile, elderflower, and tiare, this face cream can work for most skin-types, including those with more sensitive skin. One other thing I find particularly odd about Dr Botanicals is how inflated their prices are. Just since November this moisturizer has gone up by about £5 (from £39 to £44). The costs of these products seems astronomical, especially when you take a look at the simple ingredient list -- there is nothing in this tube that justifies the cost. That being said, this is a great way to try out the brand and the product, and everyone can judge for themselves whether or not they think the steep cost is worth it. These are just some reasons why I personally can't/won't use this product, however, this moisturizer does have a few big pluses working in its favour. For example, it does not contain any parabens, meaning it is free from one of the common nasties found in skincare. Plus, the cream is vegan friendly! It is also a really decent size at 50ml, so this should last several months (if not longer!). The smell is also nice, with a very subtly floral scent that is perfect for Spring. Next up is a product I know and love -- face wipes from Rawganic. I absolutely love these all natural all in one wipes, and I am thrilled to have another packet of them. Like I have mentioned before in my empties post and in other reviews, Rawganic combines ethical values with a great performing product. The wipes themselves are made from 100% organic cotton, and they contain 99% natural origin ingredients. These are super handy, and are ideal for travel or for those mornings/nights where you just don't have the time or energy to do your full skincare routine. 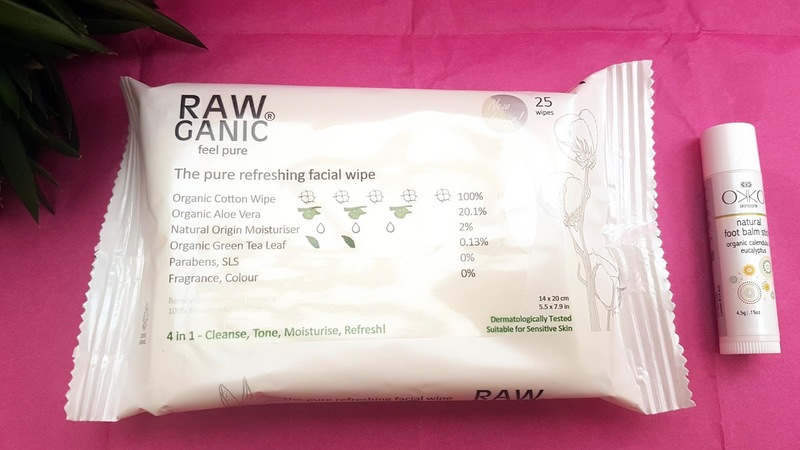 Rawganic's wipes cleanse, tone, moisturize, and refresh all in the same motion, so these seriously save on time (and money!). Another brand I am familiar with and really enjoy is OKKO, so I was really excited to see the Natural Foot Balm Stick included here. I have previously used the Face Balm, and found that really effective and not at all too heavy for combination skin. This "try me size" is great, and should last about a month if the other sample I have used is anything to go off. I love the smell, but even better is how it feels. I walk around a LOT since I do not drive anymore, and this little stick really soothes my tired feet thanks to the eucalyptus and calendula essential oils. Ingredients: Aloe Barbadensis (Aloe Vera) Leaf Extract, Mangifera Indica (Mango) Butter, Olea Europaea (Olive) Fruit Oil*, Calendula Officinalis Flower Oil*, Helianthus Annuus (Sunflower) Seed Oil*, Euphorbia Cerifera Cera (Candelilla wax), Unrefined Theobroma Cacao (Cocoa) Seed Butter*, Cocos Nucifera (Coconut) Oil*, Simmondsia Chinensis (Jojoba) Seed Oil*, Tocopherol (Vitamin E), Essential oils of Rosmarinus Officinalis (Rosemary) Leaf* & Eucalyptus Globulus (Eucalyptus) Leaf*. Limonene**, Linalool**. *Organic. 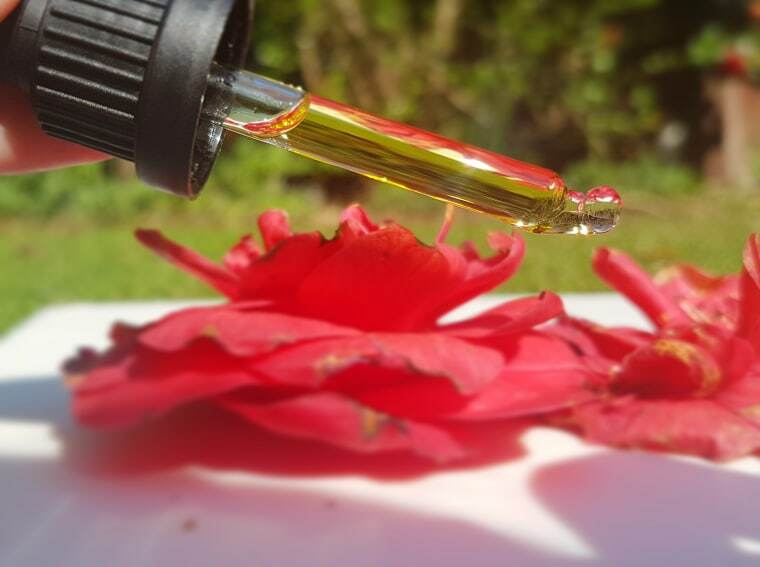 **Occurs naturally in essential oils. The final two products in the March box are both from Saturated Colour - one is a lipstick in Naked Pink, and the other is the Make Me Matte lipstick mattifier. Both of these products are cruelty free and vegan, and are very affordable options for those wanting to explore ethical makeup. While I will not be using either of these products due to personal preference, I have heard lovely things about both. I have received the mattifier in a prior beauty box, and it was a huge hit with subscribers that month, and I expect nothing less for those getting The Pip Box. 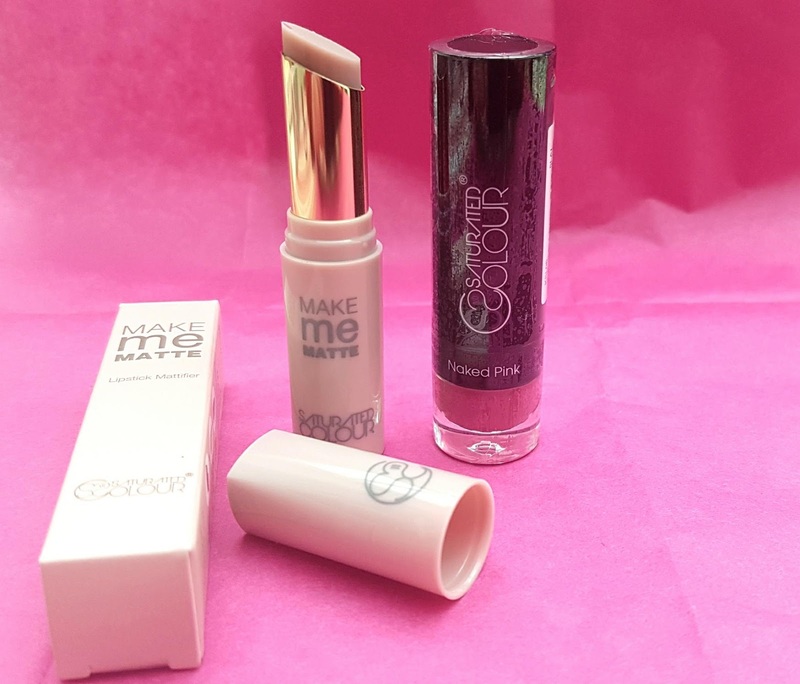 Make Me Matte is essentially a product that goes on top of a lipstick to take away the shine. Better yet, since this isn't a matte lipstick, and rather is a topcoat to your initial product, it does not dry out lips. It actually locks in any moisturizing properties, so works great with the LIPSstick that is also included in the box. The pigment in the lipstick is good, and while the website describes the formula as semi-matte, it seems more satin. One great thing about the lipstick is it is creamy and moisturizing, meaning your winter lips can get a bit of a pick me up while also looking great! Ingredients Make Me Matte: Hydrogenated Castor Oil, Ricinus Communis (Castor) Seed Oil, Caprylic/Capric Triglyceride, Talc, Ethylhexyl Stearate, Paraffin, Ethylhexyl Palmitate, Paraffinum Liquidum, Ozokerite, Polymethyl Mathacrylate, Dimethicone, Copernicia Cerifera (Carnauba) Wax, Microcrystalline Wax, Petrolatum, Polyisobutene, Cetearyl Dimethicone Crosspolymer, Methylparaben, Propylparaben. May Contain - Iron Oxides (CI 77491), Iron Oxides (CI 77499). Overall, I think the March box from The Pip Box has done a great job of creating an edit that is ideal for spring, has a huge variety of products so there is something for everyone, and has chosen a good range of values (from £44 down to £2) meaning that there is an option to rebuy in every budget. 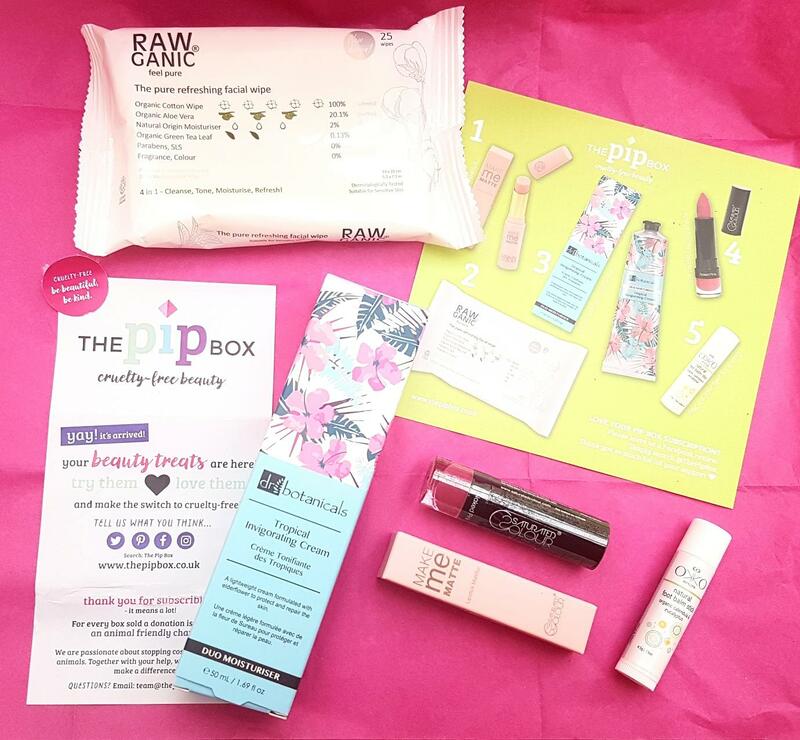 I personally found The Pip Box a nice treat to get in the post, and having seen their previous editions, I do believe they offer a focus on natural beauty the majority of months. However, this month that was not the case and so for me, the March box was not my ideal collection. I will only be using two of the items (worth a combined £6) due to personal preference and skin sensitivity to phenoxyethonal. However, I understand that the majority of people who are subscribing are not necessarily after *natural* products, but are in the market for cruelty free products. If you are specifically interested in switching your cupboards over to CF or vegan beauty, or want to build your collection, then this box is perfect for you. If you have needs beyond the aspect of no animal testing or byproducts, then you may find that the box is hit or miss. Like any subscription box, it is all up to the individual's preferences! Either way though, The Pip Box definitely values their customer's opinions, and has shown since their launch that they are dedicated to providing the best box they can each and every month. So I would love to hear what you think about The Pip Box -- is this one you subscribe to? What did you think of the March edition? And what do you look for in an ethical beauty box? And if you are interested in subscribing, head on over to their website and sign up today! Extra surprise -- I've decided to give away one of the products from this month's box! For your chance to win, enter via Rafflecoptor! I reviewed the pip box back in November and honestly loved it, I keep meaning to sign up, but forgot! 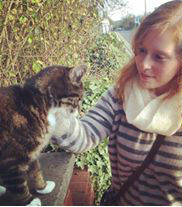 Definitely gonna do it again soon! The Rawganic wipes sound good. I'm after some biodegrable wipes for reflexology so I'll have to check them out to see if they have any others thst would be suitable. Such a shame about Dr Botanicals. It's great that they are cruelty free and vegan but such a shame about the misleading ingredients and extortionate costs! Pip Box sounds so great. I've been following them since before their first box wad released so really need to try one out. I have been looking for a new beauty box subscription and this looks great. I have to admit the PIP Box is a new one to me but I may just have to give it a try as I do like a good beauty box and I am all for finding more natural products to try as well. I used the Pip Box quite a bit last year but sadly, as I'm allergic to most perfumed cosmetics, it really didn't work for me which is such a shame as the items were amazing! What makes it more brilliant is that it is cruelty free, the items look just so amazing, I’d have to much fun going through them all. I am learning more and more about cruelty free products hence love the idea of pip box's march subscription box. There are some great selection of items there as well even though some of the ingredients were not suitable for your skin. I have seen these around on twitter and it does appear they have had some great feedback. I love that they have cruelty free and vegan products . Such a lovely subscription box and a great way to try new products. I love the fact there are full size products in it! This looks like a lovely box to receive through the post. I love reading reviews about new products especially honest ones. The wipes sound really good.